This tool is a video conferencing platform by CISCO. It is a flexible platform that operates on a variety of devices (including computers, mobile phones, etc.). It can host a large number of collaborators (up to 200 with the highest premium plan). CISCO ensures high security for the content shared over WebEx, which facilitates the sharing of sensitive information with collaborators. WebEx works very well within a collaborative framework. Figure 1. Screenshot of WebEx interface during a virtual meeting. Bennett and Gadlin state that establishing trust among collaborators is essential for a successful collaborative experience. They go on to describe how meeting regularly (whether virtually or physically) can help with establishing a highly integrated collaborative team (p. 2). With WebEx’s capacity for high quality video and audio, meeting regularly virtually becomes easier. Communication is enhanced as collaborators have access to other collaborators’ body language. Cienki writes: “Baker specifies that, “Collaboration is a specific form of cooperation: cooperation works on the level of tasks and actions, [while]collaboration works on the plane of ideas, understanding, representations” (italics in original)” (p. 554). Screen sharing allows collaborators to not only view each other’s documents but also annotate these documents during the meeting. A screenshot of these annotations (available through WebEx) can then be saved. In addition, WebEx’s whiteboard allows collaborators to write collaboratively, just as they might in a physical meeting (and perhaps making such collaborative writing even easier). Similarly, notes can be taken on a separate panel on WebEx. Both notes and screenshots of the whiteboard(s) can be saved. Thus, WebEx facilitates cooperation on the level of tasks and actions while also promoting collaboration by allowing the sharing of ideas and representations. Chang et al. described the benefits and challenges of Collaborative Auto-Ethnography (CAE). One of the features of ethnography, especially of CAE, is to keep detailed notes of observations, meetings, etc. With WebEx’s recording options, meetings with collaborators can be easily saved both on WebEx and downloaded to one’s computer. This feature thus facilitates keeping accurate records of meetings, which can serve for both research and logistical (as in planning future meetings agendas, etc.) purposes. Burnett, Cooper and Welhausen discuss the use of technology as tools, mentioning collaborators’ access to technologies as well as their level of experience with them. WebEx is free for use for groups of 3 people or fewer. However, larger groups require that the host has a license for a premium plan. These plans range from $24/month (for groups of 8) to $49/month (groups of 200). This cost is prohibitive for unfunded research, unless the collaborators’ institutions provide WebEx. However, only the host need to have the license; other collaborators can join any meeting with a free account. A purchased license guarantees 24-hour technical support, though. This might be helpful to collaborators who have difficulty adjusting to new technologies. WebEx allows users to connect via their phones or other devices. This flexibility facilitates collaboration for collaborators who might join meetings on the go. WebEx’s premium plans are not available in all countries. CISCO recommends registering for a free account for users in these countries. This restriction might limit international collaborations. On its website, CISCO states its commitment to making its products accessible to all users. WebEx, then, caters to users’ needs, which would facilitate collaborative meetings. WebEx’s features are highly useful for virtual collaborations. However, there are some features that might be improved for ease of use in collaborations. Hosting or joining a meeting on a computer involves downloading a CISCO WebEx application. Operating WebEx through a browser, rather than its app, might be easier for users, especially those with less powerful devices. Making WebEx’s premium plans available internationally would facilitate international collaborations. It might also make WebEx more popular on an international level, which might motivate international collaborators to favor WebEx over other videoconferencing platforms, like Skype. 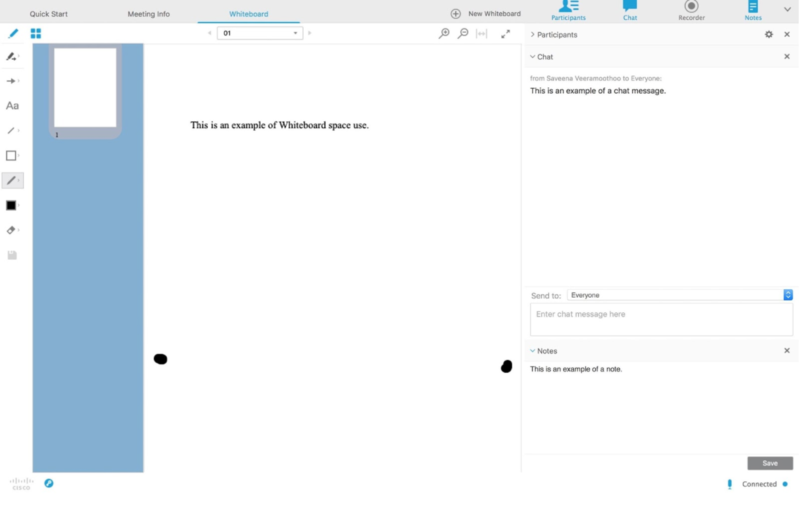 WebEx allows the taking and saving of screenshots of whiteboards. However, these screenshots sometimes do not capture important information that is just a scroll away. WebEx could implement better ways of saving the entire content of whiteboards. WebEx can be used for virtual group meetings, especially in online classes where group work might be harder for students. WebEx then can also be used for instructors to hold virtual office hours. This might make office hours and meeting with instructors in general more accessible to students. Because of WebEx’s recording features, these meetings can also be recorded and saved for future reference (for both the student’s and instructor’s sakes). Additionally, many institutions offer WebEx free of cost to students and faculty, which makes the platform financially accessible. Bennett, L. M., & Gadlin, H. (2012). Collaboration and team science: From theory to practice. Journal of Investigative Medicine, 60(5), 768-775. Chang, H., Ngunjiri, F. W., & K. C. Hernandez. (2013). What is collaborative autoethnography? In Collaborative autoethnography. Walnut Creek, CA: Left Coast Press. Cienki, A. (2015). Insights into coordination, collaboration, and cooperation from the behavioral and cognitive sciences. Interaction Studies, 16(3), 553-560. Chakrika is a PhD student at the University of Minnesota. Her research interests include intercultural communication, translingualism and pedagogy. Facebook Messenger: Distraction or collaborative tool? Yeah, WebEx is decent and is definitely easy to use. But as much as I liked it, I still traded up when I discovered R-HUB’s solution for web conferencing, remote access and support. It gives me everything I need in one device. Plus, it’s only a one-time cost.